This year marks the one hundredth anniversary of the first issue of The Art Bulletin, CAA’s flagship journal of art-historical scholarship. “Publishing The Art Bulletin: Past, Present, and Future,” an ambitious online project, has just launched to celebrate the occasion. The project employs a deep exploration of the journal’s hundred-year archive to stimulate thinking about the forms that a future Art Bulletin might take. Three outstanding essays—by Ananda K. Coomaraswamy (1939), Mehmet Aga-Oglu (1945), and Suzanne Preston Blier (1993)—stand at the heart of the project, which also features an array of features possible only in a digital format. Thelma K. Thomas, an associate professor in the Institute of Fine Arts at New York University and chair of the Art Bulletin Editorial Board, created the website in collaboration with the Scalar project of the Alliance for the Networking of Visual Culture and the University of Southern California, which helped fund the project. 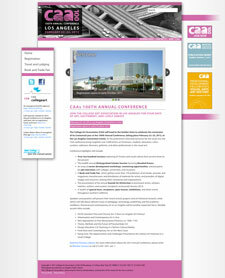 CAA extends special thanks to the supporters of the 100th Annual Conference and Centennial Celebration in Los Angeles. The Getty Foundation awarded CAA a generous grant to support the attendance and participation of twenty international art historians. The National Endowment for the Arts renewed its support of ARTspace, which is organized by CAA’s Services to Artists Committee and includes programming designed by artists for artists. CAA is grateful to the Broad Foundation for providing funding for complimentary Wi-Fi for the Student and Emerging Professionals Lounge and to the Samuel H. Kress Foundation for granting travel fellowships for international conference participants. CAA would also like to thank Art in America, the official media sponsor, and American Airlines, the official conference airline, for their contributions. This year’s Book and Trade Fair supporters were: Blick Art Materials at the Partner level and ARTstor, Intellect Books, Prestel Publishing, and Rizzoli International Publications at the Sponsor level. The Los Angeles County Museum of Art generously hosted the Centennial Reception, and Pearson presented a $1,000 prize to the recipients of the 2012 Distinguished Teaching of Art and Art History Awards. CAA is also grateful for support from the Westin Bonaventure Hotel and Suites and from Art Platform—Los Angeles. CAA extends special thanks to the Annual Conference Committee, whose members were responsible for the 2012 program: Sue Gollifer, University of Brighton and vice president for Annual Conference (chair); Sharon Matt Atkins, Brooklyn Museum; Peter Barnett, Metropolitan Museum of Art; Brian Bishop, Framingham State University; Connie Cortez, Texas Tech University; Ken Gonzales-Day, Scripps College; and Sabina Ott, Columbia College Chicago. Regional representatives for the committee were: Stephanie Barron, Los Angeles County Museum of Art; and Margaret Lazzari, University of Southern California. CAA is grateful to Jacki Apple of the Art Center College of Design and chair of the Services to Artists Committee for programming ARTspace and the Media Lounge, as well as all volunteers and staff members who made the conference possible. CAA offers additional ways to contribute to the organization. Through Planned Giving, you can include CAA in your will. You can also purchase Benefit Prints by the artists Willie Cole and Buzz Spector or a collection of Art Journal Artists’ Projects by Barbara Bloom, Clifton Meador, Mary Lum, and William Pope.L. For general inquiries on CAA’s campaigns and funds, please contact Hannah O’Reilly Malyn, CAA development associate, at 212-392-4435. 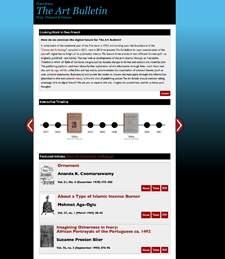 The website for the 100th Annual Conference and Centennial Celebration, taking place February 22–25, 2012, at the Los Angeles Convention Center, is now live. Get a taste of conference highlights and read about what you receive with registration, such as access to all program sessions and admission to the Book and Trade Fair. You may also begin thinking about your travel plans: American Airlines, Amtrak, and Avis provide promotional codes for special reduced rates, and CAA offers three travel stipends for attendees, including twenty awards through the newly established CAA International Travel Grant Program, generously funded by the Getty Foundation. Companies and organizations interested in exhibiting in the Book and Trade Fair will find application materials, booth descriptions, and preliminary schedules. Between now and February, CAA will update the website regularly, with new information on the Awards for Distinction presentation, special receptions, postconference tours, and more. Later this month, CAA will publish the names of the three conference hotels and list room rates and reservation instructions. The titles of program sessions, events in ARTspace, biographies of the Convocation speaker and Distinguished Scholar, participants in the Annual Artists’ Interviews, and topics of professional-development workshops will come later this fall. Online registration will open in early October 2011, with the lowest rates available for members and nonmembers alike between then and early December. To conclude the Centennial year, CAA encourages members to nominate colleagues for ten of the twelve Awards for Distinction for 2012, to be awarded next February at the 100th Annual Conference in Los Angeles, California. The different perspectives and anecdotes from multiple personal letters of recommendation provide award juries with a clearer picture of the qualities and attributes of the nominees. In the letter, state who you are; how you know (of) the nominee; how the nominee and/or his or her work or publication has affected your practice or studies and the pursuit of your career; and why you think this person (or, in a collaboration, these people) deserves to be recognized. You should also contact up to five colleagues, students, peers, collaborators, and/or coworkers of the nominee to write letters. All submissions must include a completed nomination form and one copy of the nominee’s CV (limit: two pages); book awards do not require a CV. Nominations for book and exhibition awards should be for the authors of books published or works exhibited or staged between September 1, 2010, and August 31, 2011. No more than five letters per candidate are considered. Please read the descriptions of the twelve awards, the names of all past recipients, and the full instructions for nominations. You may also write to Lauren Stark, CAA manager of programs, for more information. Deadline: August 31, 2011. The deadline for the Charles Rufus Morey Book Award and the Alfred H. Barr Jr. Award passed on July 31. Audio of the 2011 CAA Centennial Session on “Feminism,” chaired by Norma Broude of American University and Griselda Pollock of the University of Leeds, has been uploaded to the website of Documenta, the major international art exhibition that takes place every five years in Kassel, Germany. The next one, Documenta 13, is scheduled for June 9–September 16, 2012, and its website has become a repository for news on preliminary events and happenings as well as a forum for discussing timely issues in the art world. Its artistic director, Carolyn Christov-Bakargiev, a panelist in the “Feminism” session, arranged to have the 2½-hour audio recording posted to the Documenta website, where it will be permanently archived and available to promote discussion among a worldwide array of visitors to that site. 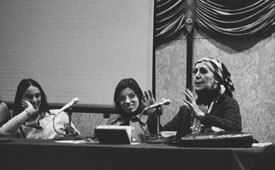 The CAA session was organized as two panels: the first on “Attaining Full Equality: Women, Artists, Museums, and Markets,” moderated by Broude, and the second on “New Directions and International Perspectives in Feminist Art History,” led by Pollock. After four decades of feminist scholarship and political activism in the art world, and on the occasion of CAA’s centenary, the session brought together a cross-generational and international group of museum-affiliated curators, international art-fair and exhibition organizers, art-market experts, and art historians to share their perspectives on present accomplishments, institutional impediments, productive strategies, and future frontiers for feminism’s creative enterprise. The Getty Foundation has awarded a $100,000 grant to CAA in support of international travel for twenty applicants to attend the 100th Annual Conference and Centennial Celebration, taking place February 22–25, 2012, in Los Angeles. Through the new CAA International Travel Grant Program, CAA will provide funds for travel expenses, hotel accommodations, per diems, and conference registrations. Recipients will also receive one-year CAA memberships. Applicants may be art historians, artists who teach art history, and art historians who are museum curators; those from developing countries or from nations not well represented in CAA’s membership are especially encouraged to apply. The goal of the project is to increase international participation in CAA and to diversify the organization’s membership (presently sixty-five countries are represented). CAA also wishes to familiarize international participants with the submission process for conference sessions and to expand their professional network in the visual arts. Members of CAA’s International Committee have agreed to host the participants, and the National Committee for the History of Art will also lend support to the program. CAA will publish an official call for grant applications on its website on Friday, July 8, 2011; the program will also be publicized in CAA News. A jury will select the twenty grant recipients. In conjunction with the publication of The Eye, the Hand, the Mind, CAA has been conducting short email interviews with the many contributors to give an overview of the book’s diverse components. The artist Ellen K. Levy and the art historian Matthew Israel have participated thus far, with additional interviews to be published later in the spring and summer of CAA’s Centennial year. Ellen K. Levy’s chapter, “Art in an Academic Setting: Contemporary CAA Exhibitions,” focuses on the organization’s role in supporting artists and exhibitions in recent decades. She explores the annual Regional MFA Exhibitions, which began in 1989 in San Francisco, and researched the shows that coincided with the Annual Conference, including Techno-Seduction, held in New York in 1997, and New Space, New Audience, CAA’s first and only online exhibition from 2001. Matthew Israel’s chapter on “CAA, Pedagogy and Curriculum: A Historical Effort, an Unparalleled Wealth of Ideas,” considers how the organization’s journals, research initiatives, and conference programming reflect its varying commitments to teaching. Jonathan Lackman of the Art History Newsletter published the first review of The Eye, the Hand, the Mind on February 24, 2011. The year 2011 marks the College Art Association’s one-hundredth anniversary, a celebratory occasion for any organization but particularly so given CAA’s dynamic influence in shaping the study and practice of the visual arts over the past century. Without dedicated members like you, CAA would not be where it is today. Show your support with a donation to the 2011 Centennial Campaign. The Centennial Campaign is an opportunity for you to help CAA support the field and give back to its members. Your contributions allow us to provide fellowships to MFA students, keep conference rates affordable, and subsidize the memberships of student, retired, and low-income members. Donations also help publish an information-packed website, which features calls for entries and papers and listings for grants and fellowships in the Opportunities section, as well as job classifieds in the Online Career Center. Additionally, your donations support advocacy at a time when art is, once again, under political attack. Contributions at every level are appreciated and will be acknowledged publicly; they are also 100 percent tax deductible. Your generous gift will both sustain the organization now and guarantee its leadership role over the next one hundred years.